Tram 277 in revenue-earning service at Massarelos in July 2001. The city's bus and tram operator is S.T.C.P. (Sociedade de Transportes Colectivos do Porto), whose web site is an excellent resource for the visitor. As well as transport details, it also has illustrated tourist information. S.T.C.P. grew out of the C.C.F.P. (Companhia Carris de Ferro do Porto) in 1946. In the 1950s the tram fleet stood at 193 motor vehicles and 24 trailers and the network extended over almost 250km. from 1959 the network was reduced. By 1992 only 33 trams survived of which 19 were in daily use. At its nadir the tram network consisted only of a short route from Massarelos depot along the river front to Infante, south of the city centre. But there has been a recent encouraging expansion of routes run by the surviving fleet and these now total three (see below for details). Pictured left is car 315 and, right, car 500, in the Massarelos museum. Above: In a photo kindly provided by Tim Fenton in October 2005, the service 22 (tram 143) is seen in front of the Carmo monastery in central Oporto. Behind it is the other extreme of Oporto's transport, a gas-powered bus. Route 22. In September 2007, after a gap of 30 years trams returned to Oporto city centre as route 22. This development was possible after the local council had re-laid and re-opened the line from Carmo to Praça (da Liberdade) in the heart of the city and from there up the hill to Batalha to the upper station of the restored Guindais funicular. 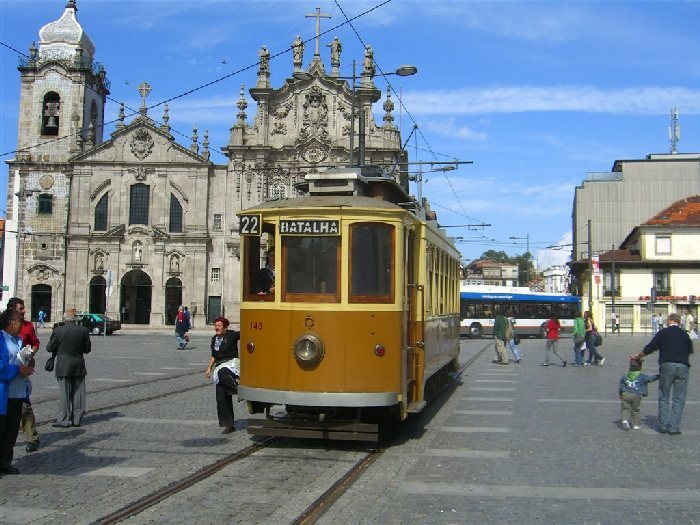 Six trams are in use from the surviving STCP fleet, housed at Massarelos The new route runs from Batalha to Carmo from 10am to 7pm every 30 minutes and passes through Cordoaria, Clérigos, 31 de Janeiro, Batalha, Guindais Funicular Station, Santa Catarina, Passos Manuel, D. João I Square; Aliados Avenue, Filipa de Lencastre Square, Ceuta and José Falcão Streets and Guilherme Gomes Fernandes and Gomes Teixeira squares. STCP also has plans to reinstate services along the coast from Castelo do Queijo to Foz. This should be operative in 2007. New magnetic track brake equipment is being fitted to the operating fleet to ensure there are no runaways on the extended network which has steep inclines on it. Traffic is growing and to cope, the remaining stored bogie cars are all being overhauled and returned to service. These include a number of carros belgas. Right: Courtesy of Don Gaunt is this picture of tram #143 on the new route 22 in November 2007 near the Pr. da Liberdade. Route 1E Until the opening of route 22, route 1E with the later route 18 (see below) was one of only two routes operating in Oporto. This route comprises two sections. Route 1E barré (i.e. the figure 1 with a line through it) runs along the river-front from Passeio Alegre (Cantareira) eastwards to Massarelos, from where Route1E was the only tram service operating in Oporto. This route comprises two sections. Route 1E barré (i.e. the figure 1 with a line through it) runs along the river-front from Passeio Alegre (Cantareira) eastwards to Massarelos, from where Route1E proper continues towards the city waterfront terminus at Infante. The E suffix denotes the service is run by an "eléctrico" i.e. a tram. The westwards portion from Massarelos to Passeio Alegre (Foz) was reopened in 2002 having previously been a closed section of the old tram 1E which ran all the way to Matosinhos from Infante. Route 18 Since 17 December 2005, this route from Massarelos has run up the steep uphill route via Viriato (Rua da Restauração) to its historic terminus at Carmo, having for several years terminated at Viriato, just short of the city centre area. The journey, mostly on single reserved track at the top end, affords good views across the river to the right and up to the Palácio de Cristal gardens to the left. Service frequency in 2007 is half-hourly. Normal STCP travel cards are accepted on the trams. However the new “Yellow City Cruises” ticket introduced in July 2007 is not valid on service buses or trams. The Yellow ticket allows use of the "Circuitos Turísticos Porto Vintage", the River Douro cruises operated by Douro Azul and a visit to the port-wine lodge of the Ramos Pinto company in Gaia. It costs (2008) seventeen Euros and is valid for 24 hours which includes a single visit to the wine-lodge and one river cruise. Thanks to Mike Russell for some of the information on this page.. Above: Car no.270 in a rather poor state is seen at the Matosinhos terminus in 1993.. Above: Carro Belgo 287 seen near the Castelo do Queijo in 1984.. The site of the STCP museum was owned by the Companhia de Viação Eléctrica do Porto (Oporto Electric Traction Company) from 1907. In 1908 this company merged with the CCFP -Companhia de Carris de Ferro do Porto (Oporto Tramway Company), which had been established since 1873. Mule cars had run in the city since 1874 and electric trams from 1895. Massarelos Tram Museum: Museu da S.T.C.P. The Oporto tram museum is located at Massarelos, near the river front, to the west of the city centre. It is housed in over 1940 sq. metres of covered accommodation adjacent to the operational tram shed on the site of the former STCP generating station, built in 1915. Admission is modestly priced. As you enter the museum you pass through an interesting shop with publications, models and other items on sale at reasonable prices. The main tram shed was at Boavista but its site has now been converted into a huge award-winning Casa de Música (Music House) The tram museum opened in 1992 and is well laid out with a wide range of trams, auxiliary vehicles and artefacts. The initial 1992 display comprised 11 vehicles, but it has since been expanded. Adjacent to the museum shed is the operational shed, which is not open to visitors, except by arrangement. Built by A Construtora (Porto) c 1909. It was rebuilt and altered both in the 1920s and 1947-49. It operated in service till 1959. It has two Brill bogies and seats 32. Restored in 1990-91 to its 1920s' state. Purchased from Starbuck of Birkenhead, England, in 1874 this was a two-mule car which later became a trailer to both steam and electric trams. 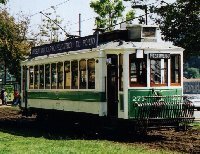 It first ran in 1872 and remained in service into the 1960s. It has 12 places on longitudinal central benches. Built by CCFP in 1934 and in service till the 1960s on line 1. Seats 20 on a Brill chassis. restored 1991. Carro eléctrico (electric tram) no. 22. This is a mulecar, built by Starbuck of Birkenhead but transformed into a motorised car by A Construtora in 1895-98. Built on a Brill 21E chassis its motor was removed in the 1930s and the car became a trailer. As part of its restoration in 1990-91, it was remotorised. It seats 18 on longitudinal benches. This trailer dates from 1946-47 and was built by STCP. It ran as a motor car from the 1950s till 1967. Originally it seated 20 but widening of its gangway reduced this to 15. It was restored to its trailer state in 1991-92. A 1932 vehicle used for overhead repairs, restored in 1992. A survivor from a fleet of more than 30 non-passenger vehicles in the Oporto tram fleet. Fish were transported between the river-front and the canning works at Matosinhos, as well as to the Mercado do Anjo (fish-market). It was built by CCFP in the 1920s and from the 1930s was used for carrying STCP materials. Restored in 1987. Carro eléctrico (electric tram) no. 315. Built by CCFP in 1929, this car remained in service till the early 1980s. Known as a "fumista"or "smokers' car", the type is characterised by very large opening windows. Orignally they seated 28, but latterly only 22. It has a Brill chassis and 2 x 55hp motors. In length it is 9.57m and its width is 2.47m. Restored 1990-91. Carro eléctrico (electric tram) no. 373. Built by STCP in 1949, this is a single-ended car which utilised parts from earlier vehicles. It has Brill chassis and 55hp motors. It seated 21 passengers and ran until 1974. restored in 1990. Carro eléctrico (electric tram) no. 500. 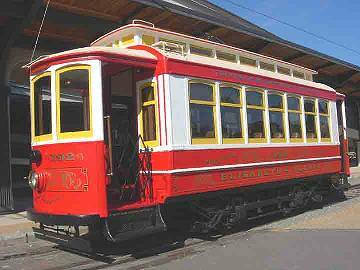 Constructed by STCP in 1951 this car was intended to be the model for the future Oporto tram fleet. However, although 500 ran until 1971 no others of its class followed. It seated 22, ran on a Brill chassis and had two 68hp motors. It is 9.69m long, 2.27m wide and weighs 12,150kg and was restored in 1981. This German-built Hansa-Lloyd tower vehicle was used for repairs to the overhead catenary of Oporto. It was bought in 1929 and ran till the 1950s. The vehicle was restored to its original form between 1989 and 1991. The vehicle could carry five staff and has a 3970cc engine. The tower is raised manually. Zorra de transporte de carvão (Coal wagon) no. 66. Built c.1915 by Carris to bring coal from São Pedro da Cova and to return ashes from the Massarelos power station. Although subsequently used as a covered wagon for repair work by STCP, it has been restored (1992/93) to its coal-carrying state. Acquired from Brill of Philadelphia in the USA in 1905, this is a 22-seater which ran as no.107 and was withdrawn from service in 1967. Although it had headlights and an illuminated destination board, its seating still comprised longitudinal benches. restored in 1992/93. Built by Carris in 1930, this 40-seater was designed to run without windows in summer and was known as a "fumista" or "smokers' car". An eight-wheel bogie car, 269 ran until 1990 and was restored in 1993. Acquired in 1929 and restored in 1993. A power car used primarily for coal transport and track-repair materials. Restored in 1996. 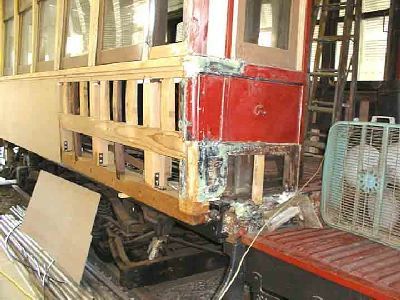 A rebuild of a car from the first decade of the 20th century, which was damaged in a major fire at the Boavista tram depot in 1928. An animal-drawn vehicle, motorised in the first decade of the 20th century and rebuilt in 1996-97. Restored in 1994, this is an English Electric (Preston, England) vehicle which ran from the early 20th-century until the 1980s. Built by CCFP in 1927, this car ran till 1981. It is known as a carro italiano owing to its Italian motors and was restored in 1994. This ran from 1930-89, having been built by CCFP. Restored in 1994. A locally-built car which ran from 1928 till 1994, when it was restored. A "carro belgo" or Belgian car, built in 1929 by the Ateliers de Construction Familieureux. It was restored in 1995/96. 9 (Mule-car) and Brill bogie car 273 - National Tramway Museum, Crich, Derbyshire (UK). 192 (Brill 28) Seen above, this car ran again on October 1, 2005 after four years of restoration at the Science Museum of Virginia in Richmond Virginia. It will run on a temporary track while a short loop of track is constructed behind the museum. Restoration took about 5,000 hours. 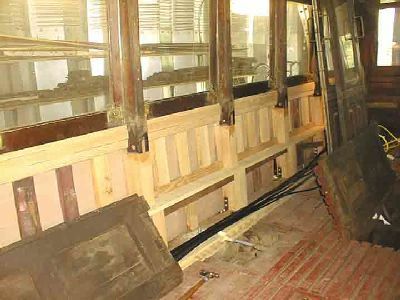 The interior mahogany has been refinished, and the car has been rewired. (Information and photo, courtesy of Carl Brummer). 122 (Brill 23) - McKinney Avenue Trolley Authority -Dallas (Texas, USA). 137, 171, 193 - these trams were given to the Museu Vivo do Bonde in Santos, Brazil by STCP in September 2005. They will run in Oporto livery on a historic tourist line on 1700mm gauge. 172 (Brill 28), 249 (Brill bogie) and works car C-64 are at Rockhill Trolley Museum in Pennsylvania. Numbers 252 & 258 (Italianos)- Buenos Aires(Argentina). 254, 260 (Italianos) - Yakima, Washington (USA) numbered as 1976 and 1776 respectively. Above: Extensive work is often necesary to making trams operational after withdrawal from service. Above are pictures of the refurbishment of Oporto 192 at the Science Museum of Virginia in Richmond Virginia. 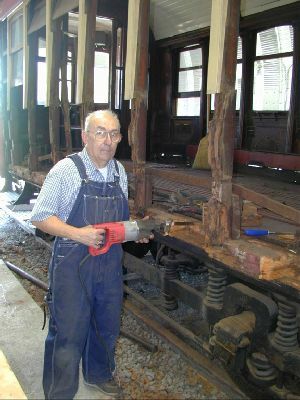 The above images comes courtesy of Carl Brummer, who is himself pictured below on the restoration project..